While Russia has many folk dancers, traditional American square dance is a real novelty here. A two-year-old Moscow Club has garnered some international attention. Alsu Alyusheva, a young Muscovite, likes to spend her free time dancing. While many her age dance in sequined mini-dresses to a techno beat in a strobe-lit club, Alyusheva “do-sa-dos” to the directions of a “caller” in her wide, wide skirt. 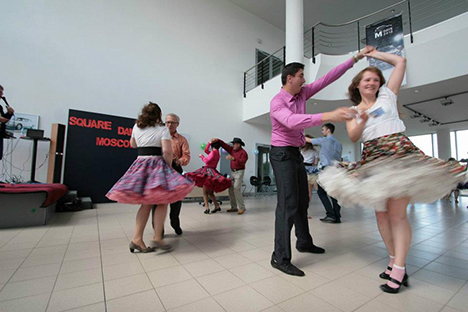 Alyusheva is the founder of the Red Square Dance Club at Moscow’s American Center. The club is celebrating its two-year anniversary. During that time, it has evolved from a small, hit-or-miss group of people who like to dance to a close-knit international team. While Russia has many folk dancers, and even a few dances that resemble square dance, traditional American square dance is a real novelty here. The first club appeared in 2004 in Petrozavodsk. Soon after a club appeared in St. Petersburg, Murmansk, Pskov and finally, Moscow. Alyusheva explains that square dancing provides a great international setting of likeminded people. “During my studies in Germany, I lived in a family where the parents, children, and even grandparents were fond of square dancing – and I became involved too,” Alyusheva said. Square Dance is one of few dance styles that is not competitive. The fun is in the process. Four couples form a square (each pair, a man and a woman, stand on the four sides of the square) and move to the caller’s commands. Every club uses the same terms so the language is international – if you learn to dance in one club, you can dance in any club in the world. The Red Square Dance Club first met in the Russian-German House but a few months later moved to the American Center at the Library of Foreign Literature. It is named for the heart of Moscow, Red Square, and the square that is the foundation of the dance. The club is a non-profit organization, and so receives some financial support from international organizations in the United States and Germany. Many foreigners from the U.S., U.K., Canada and Germany belong to the Russian dance club. They live and work in Moscow, but the club feels like home. Some also mentor by teaching the elements of the dance to newcomers. “Square Dancing is easy to learn and simply fun. We don’t have to think too much about the moves so we get to do a lot of socializing while we are dancing,” said James Martin, an English teacher from Iowa. Last summer, Kormakov represented the Moscow club at a festival in Kladno in the Czech Republic, which attracted dancers from all over Europe, and at the German festival in Augsburg.